Diagnostic imaging is the most important step in your cosmetic or restorative treatment plan – with 3D digital imaging technology, we can ensure the most accurate and precise results for your smile. Digital imaging has been an important part of dental health prevention and treatment planning for years. For instance, digital X-rays have largely replaced traditional ones thanks to their high accuracy, safety, and convenience. 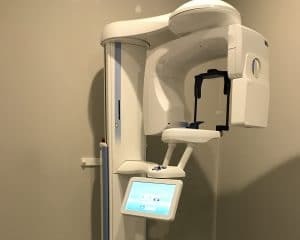 For more detailed imaging and treatment planning, we also employ advanced 3D imaging, which utilizes cone beam computed tomography (CBCT) to produce a digital 3D image of your teeth, roots, jawbone structure, and oral tissues. The image is created by taking multiple cone beam X-ray images from different angles, then combining them into a comprehensive model of your mouth. By utilizing 3D imaging, we can provide a higher level of diagnostics and quality cosmetic and restorative treatments, all while minimizing the time you have to spend at our office. Unlike traditional imaging, digital images are produced instantly and projected onto a high-definition monitor, allowing you and your dentist to view the images simultaneously while discussing your treatment. 3D imaging and software also allow us to create an accurate image of what your smile will look like after your treatment is completed. When Is 3D Imaging Recommended? While digital X-rays are taken at least once a year to keep your dental records updated, 3D imaging is typically only recommended in cases of involved treatment, such as smile makeovers and full mouth reconstruction plans. Other treatments, like same-day crowns, dental implant placement, and the creation of customized maxillofacial prosthetics, can also be performed using 3D imaging.